What’s the best camera gear for nature and wildlife photography? What is a basic inventory of photo gear that you should have to shoot quality images of wildlife and natural areas? Savage Camper asked Joseph Van Os the founder and owner of Joseph Van Os Photo Safaris, the largest tour company in the country devoted exclusively to photo tours, to tell us what gear he uses and recommends that his tour customers take with them on his tours. What Cameras Do You Use and Recommend ? My tour leaders are divided about half and half between Canon and Nikon. I personally use a Canon 1D X Mark II, but there are plenty of less expensive Canons and Nikons that will do the job. I recommend that guests on Photo Safari tours take two camera bodies in case you drop one or one packs up on you. Many people have a really good body and then a lesser one that’s their backup in case one meets its demise. How about Lenses? What do you Recommend? Does a Person Shooting Wildlife Need a Bigger Lens ? The 100mm-400mm zooms are very useful for some wildlife shooting. But for serious wildlife shooting, sooner or later you’re going to want a big prime lens like a 500mm, 600mm or 800mm. 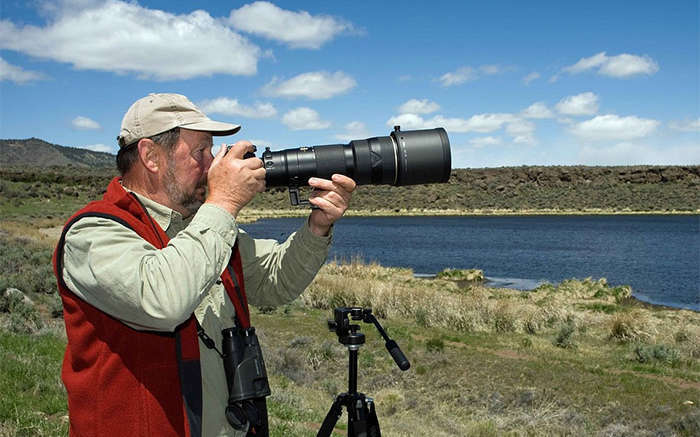 The Canon 500mm and a Canon 1.4x teleconverter is the common big lens most serious wildlife shooters take on our trips. The Canon 800mm is normally a bird shooter’s lens. Most customers own their gear but in some cases they rent those big lenses. What’s the Best Lens for Landscape Photography? I carry a Canon 16-35mm zoom, a Canon 24-105mm zoom and a 100-400mm zoom. Those three lenses would be all I would normally need on a landscape trip. Without a doubt a sturdy tripod and a ball head are important in creating sharp images – especially when using the super telephotos like a 500mm or larger. Really Right Stuff and Gitzo Tripods make very good carbon fiber tripods. Cheap tripods are worthless. Be the first to comment on "Best Camera Gear for Nature and Wildlife Photography"